This post contains spoilers about Inception the movie. If you haven’t watched it and don’t wish to get spoiled, hold off on this post until you do. After hearing a lot of positive comments about Inception and avoiding reviews/spoilers/potential spoilers the past few weeks, I finally watched it earlier this week with a friend. The film is impressive for all the reasons everyone has been talking about. Beyond the clever plot, engaging story and special effects, there are also important personal development lessons that we can take away from the film. Before going into that, let me share my quick review of the movie. The review is not related to the eight personal development lessons, so if you want to get right to the 8 lessons, scroll to the next section of this article. Otherwise, continue reading :D.
Dom Cobb (Leonardo DiCaprio) is a skilled thief: stealing valuable secrets from deep within the subconscious during the dream state when the mind is at its most vulnerable. Cobb’s rare ability has made him a coveted player in this treacherous new world of corporate espionage, but it has also made him an international fugitive and cost him everything he has ever loved. Now Cobb is being offered a chance at redemption. One last job could give him his life back but only if he can accomplish the impossible – inception. Instead of the perfect heist, Cobb and his team of specialists have to pull off the reverse; their task is not to steal an idea but to plant one. But no amount of careful planning or expertise can prepare the team for the dangerous enemy that seems to predict their every move. My synopsis: Cobb (the main lead portrayed by Leonardo Dicaprio) is a professional thief, hired to extract secrets from people’s minds. He’s now hired by Saito (Ken Watanabe), a highly powerful businessman, to do the opposite – to plant an idea in someone’s mind (a competitor) so his empire will not be threatened. The movie shows how Cobb engages his team, creates a plan to pull it off and executes it. While he’s working to manipulate others’ subconsciousness, he deals with subconscious issues of his own. First things first. Inception is definitely an impressive movie on many fronts. What I feel are the strong points about the movie are probably what many people have been raving about. Firstly, the story is engaging, the plot is clever, script is very meticulously written and the acting has depth and the movie is extremely well directed. On the acting, it’s interesting to see how Leonardo Dicaprio has matured so much from his teen heartthrob status a decade ago; Cillian Murphy playing Fischer did amazing and Tom Hardy was funny as Eames (the guy who kept making sarcastic quips at Arthur). On the post production front, pacing is right for a movie of that length, production quality is top notch and the special effects are nothing short of amazing. In the second half, I felt myself genuinely caring for the characters and wanting them to get out of the dream world and limbo alive. The amount of attention and detail that Nolan went into making this film is nothing short of astounding. That being said, I felt somewhat dissatisfied/empty after watching the movie. It was like the movie was impeccable in itself, yet it seemed like something was missing. At first I couldn’t quite put a finger to it, but afterward I realized the answer. I have no qualms with the movie within its premise. What I have qualms with is the premise that Nolan chose. By premise, I’m referring to the dream rules they came to. If you recall any one of your dreams, you might notice that they can get really out of the world. In our dreams, almost everything defies logic, random oddities are norm (while carrying their own symbolism), things are fluid and constructs blend into one another (ala Eternal Sunshine of the Spotless Mind). My dreams usually have a ‘hazy’, fog-like quality to them too. It seemed Christopher Nolan took a more systematic, real-world approach to the dream world when there is so much more he could have played around with. Because of that, the dream world in the film felt very restrictive, rooted and structured (from the rules, right down to the architecture itself) and came across more like a real world than a dream world. Save for structural paradoxes and defiance of the law of physics, there wasn’t really anything different. By not harnessing the full boundaries of the dream context, it somewhat defeated the purpose of having a dream world context. That being said, this movie is a masterpiece in itself. Don’t take the above as a complain the film is bad – it isn’t. I really like Inception and might watch it again to catch the details I missed the first time. A top film and a must watch if you haven’t. It’s the type of film that gets better with repeat viewings. By the way, I know there are tons of interpretations of the movie ending. For me, Cobb was in the real world in the end (i.e. the top topples over) since it’s obvious the top was wobbling at the end. I did find it queer how his kids had the same exact clothing in the end scene and didn’t look any older (though it was never mentioned how long he was away). A review I read pointed out that Cobb always had his wedding band during the dream scenes but not during the reality scenes. Since he didn’t have his wedding band at the last scene, it likely means he was in the real world. As I mentioned earlier, the premise of the film is this: Saito, a highly powerful businessman, wants Fischer, the son of a terminally ill corporate rival, to break up his father’s empire so Saito’s own business empire would not be threatened. He hires Cobb and his gang to do an inception – to plant the idea in Fischer’s mind. As benign as it sounds, it is from the planting of this idea in Fischer’s mind that will set in motion the steps that will eventually lead to the break up of his dad’s massive empire in reality. Cobb himself said that once the idea is planted in a person’s mind, it’ll change the person’s reality – forever. There is no stopping it after that. How does this relate to personal development? If we think about our goals and dreams, they all have to start off as ideas in our minds. It’s not possible for anything in the physical world to exist without ever having been created mentally. Look around at everything in your reality. Your computer. Your table lamp. Your spectacles (if you wear them). Your clothes. Your room. Your house. All of them began at some point in time as a seed, an idea, in someone’s mind – whether it’s the architect, the designer, the engineer etc. What this means is you should be pay less attention to what’s possible and what’s not possible (physical reality) and focus more on thinking about what you want (mental reality). Because once you discover what inspires you, that truly drives you, you’ll take the actions necessary to bring it to life. To create your success in the physical world, you have to first have to be clear of how it looks like mentally. I’ve written about this before in Know your WHAT first, then Devise your HOW. WHAT refers to what we want – our goals, our dreams, our vision. HOW refers to how to achieve those goals. Many people get intimidated by the HOW and stop themselves from thinking about their WHAT. The correct order is to first dream up your biggest dreams and ideas in your minds (your WHAT), then identify how you can bring them to life (your HOW). It’s only by first knowing what you want that you will be able to bring them to live. 2. Our subconsciousness has unlimited resources. Learn to tap into it. Or in other words – “Don’t bury unresolved issues”. Cob tried to bury his deepest regrets and guilt in his subconsciousness. He created a prison to dump them in and locked them away, without intending to address them (or at least he was trying to block them away as long as he could). However, the more he tried to push them away, the more the inner issues came back to taunt him. Throughout the film, you can see these issues surfacing in different ways – at first it was sporadic, then later on it became more frequent, and in the most unexpected situations. They were also self-sabotaging. For example: Mal tried to jeopardize his assignments; there was the part where the train suddenly appeared out of nowhere in the first level inception dream sequence; the kids’ illusions kept appearing and distracting Cobb. It was only when Cobb addressed these issues in the end that he finally got control of the situation. What does this mean? If you have certain problems or unhappiness, don’t bury them. This includes feelings of frustration, disappointment, sadness and pain, fear, negativity, and so on. It also includes disagreements with your partner, family, friends, colleagues, and so on. Hiding from such problems won’t solve them. At first it may seem it’s ok, but after a while they’ll resurface – at first sporadically, but then more and more regularly. The further we run and the more we try to prevent these don’t exist, the more the issues will tear through our subconsciousness to stop us. In fact, they often appear at least expected times and freeze us in our tracks. Avoidance is never a solution to anything. The best way to deal with our issues is to deal with them straight on. That’s what it means to live life in liberation. Cob’s issues were not created out of thin air. They originated from somewhere – the one point where he planted the seed in Mal’s mind that the world was an illusion. And when Mal later passed on, he lived in regret because he couldn’t fulfill his promise to her that they would be together forever. In continuation with point #4, if you want to address the issue, you have to address the root cause. For Cobb, ignoring/avoiding the problem didn’t solve anything (see point #3). Fighting the manifestations of his regret didn’t solve anything either – it just made things worse as he swirled in more regret. The problem or manifestations of the problem simply came back each time, in different ways. It was only when he uncovered and acknowledged the root cause (that he was the indirect cause of Mal’s death, and hence broke the promise that they’d live together forever) that he was able to address his guilt (they did live old together in limbo and he fulfilled his promise. He was merely living in the past and he had to move on and be with his kids). Relating this to personal development – If you’re facing a problem, trying to tackle the problem itself will only solve it temporarily. For example, forcing yourself not to procrastinate addresses your procrastination within that one-off incident, but it does not solve the real issue of why you even procrastinate to begin with. Forcing yourself to go to work in a passionless job will help you to last another day, or week, but it does not solve the original problem that you’re working in a place you don’t like. The issue (or manifestations of the issue) will keep coming again and again, in different forms, until you get to the core and tackle the root cause. This is the same problem why people are looped in patterns of behaviors in their life and don’t break out of it even though they try to – it’s because they are addressing the effects and not the real issues that arose to the patterns. Once you truly understand what the root cause is, the issue will automatically dissipate. This stood out strongly to me in the movie, especially in the second half in the warehouse scene with Fischer and Eames (pretending to be his godfather). From the conversation and later on in the ending scene, you could tell Fischer loved his father a lot. All his life he did his best to follow in his footsteps so he could be accepted by his dad, but his dad never reciprocated it. Instead all his dad ever did was to resist his son. He never as much talked to Fischer, and when he did it was some snide or sarcastic comment. This created a lot of pain in Fischer’s heart. He never told anyone about this and kept it inside of him. While on the surface he was a highly successful businessman, with great wealth and power, inside he longed for love and acceptance. Is there anyone you are / have been resisting in your life? Your mom? Your dad? Your brother(s)? Your sister(s)? Past relationship partners? Your guardians? Children if you have any? Other people whom you used to be close to but aren’t now? Why are you resisting him/her/them? Every time we resist someone, especially someone close to us, we cause them pain that we are not aware of. The person may seem okay on the outside, but he/she is actually hurt on the inside. At the end of the day, when our resistance to others around us is really just causing hurt and anguish to the ones we love the most. So stop resisting people around you. Start with small acts of kindness. I’ve to admit that I took my parents for granted many times in the past and never did much to express my love to them. Lately I’ve been kinder to them, talking to them more often and showing more concern. While these are just small changes on my part, they convey my love to my parents and I know they feel it. 🙂 At the same time, they also treat me in the same manner with love and concern. When Cobb and gang were discussing how to get Fischer to break up his father’s empire, they toyed with a few ideas. For Fischer to make a drastic decision like that, there had to be a huge motivator or call to action. They went ahead with the positive motivator (Fischer should break up his empire because his father wanted him to create his own path) because it had more power over the negative motivators (e.g. Fischer should break up his empire to spite his father). Similarly in life, there are always 2 key groups of motivators. One is fear. The second is love. Fear, or negative motivators, refer to feelings of trepidation or anxiety that drive us into action. For example, doing something in fear of punishment/losing out/competition/being lesser than others. While these can drive us to take action, it’s short-lived. We only act when such feelings are stirred. In the long-run, it creates wear and tear in our system. It also creates inner weariness, as we’re just acting out of fear/pride/scorn. On the other hand, love/inspiration, or positive motivators, are the true north drivers that will spur us endlessly, day after day, in joy and happiness. Focus on doing what you love and happiness will ensue. If you’re truly pursuing something you love, your love for it will drive you to places which you can’t even imagine. I started pursuing my passion since 2008 and my love for growing and helping others grow has drove me to create Personal Excellence, me starting my training school The School of Personal Excellence, and many more. If it’s not for my passion for my work and my passion for all of you, I would never ever done any of this. Today I really love life and I can’t wait to see what lies next as I continue walking down this path with all of you. Even though Cobb appeared fine on the outside, was able to communicate fine with everyone and was great at his job, he was battling with many inner demons on the inside. Every night, he would hook himself up with the “dream machine” so he could spend time with Mal – in his mind. Nobody knew that except for Ariadne, and that was because she was in Cobb’s dreams and saw what he was going through inside. And rather than run away, Ariadne stuck all the way to help Cobb through his problems. Sometimes you might feel you’re overwhelmed with problems and you feel you’re the only person in this world dealing with them. However, it’s not like that at all. Everyone, everyone you see around you, has his/her own problems and challenges to deal with. So don’t think you’re by yourself in what you’re going through. If you’re facing this problem, there are at least tens of thousands of people out there who is undergoing the same thing too. You’re not alone. We’re all here for one another. Remember no matter what happens, I’ll always be here at this blog until the day I die, writing articles every other day and working together with everyone of us to grow consciously and live our best life. How do you find the 8 lessons above? 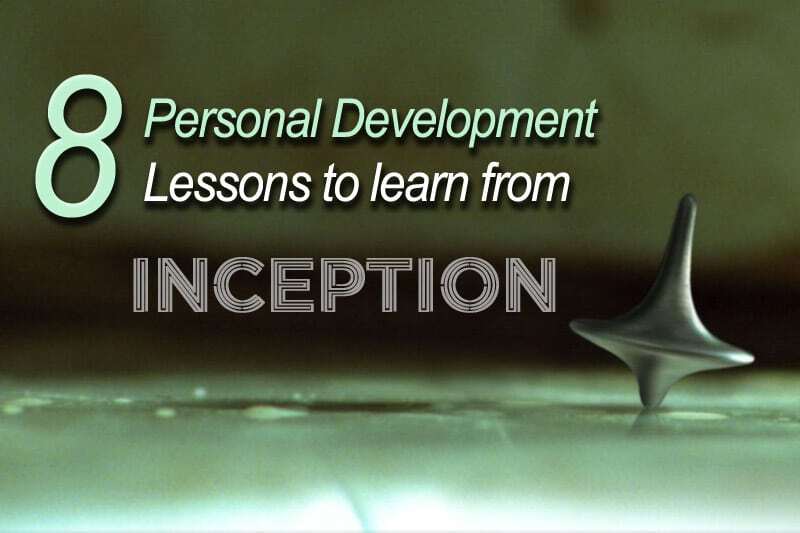 If you have watched Inception and taken away any lessons from it, then you may add them to the ones in this article and increase the benefits derived from them. Check out these movies too: 13 Inspirational Movies With Important Life Lessons To Learn.